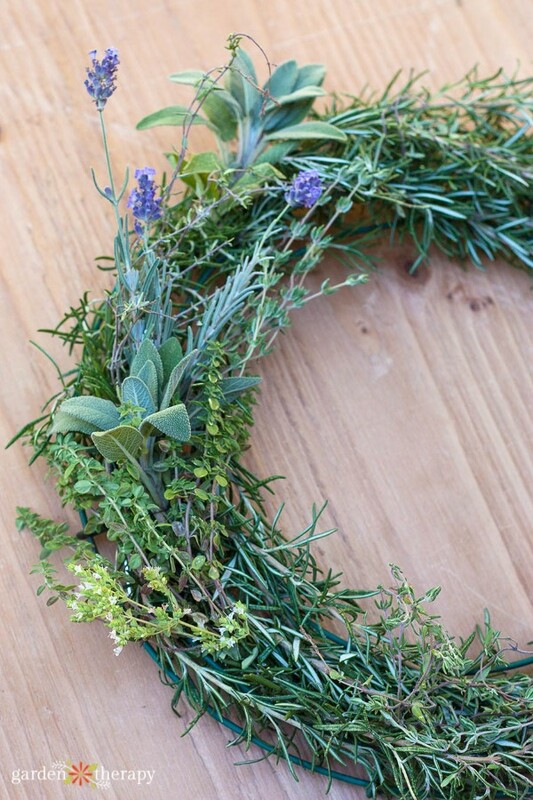 This year when you are harvesting your lush herb garden, why not reserve some for making an herb wreath? Not only are they beautiful, but they are functional too! 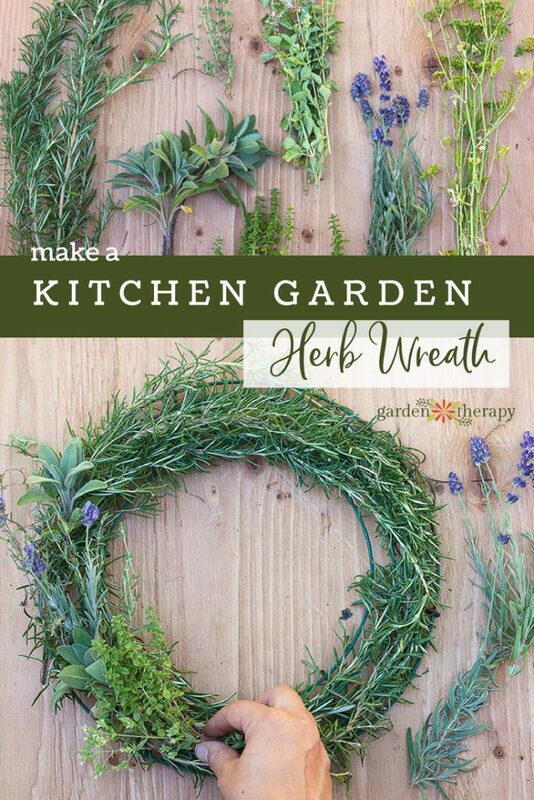 Hang an herb wreath in your kitchen and harvest sprigs here and there to add to your cooking. The herbs will dry on the wreath form, looking beautiful and preserving the flavor while releasing fragrance throughout the space. Herb gardening has become one of my favorite hobbies and this year I’m growing over 25 different types of herbs! 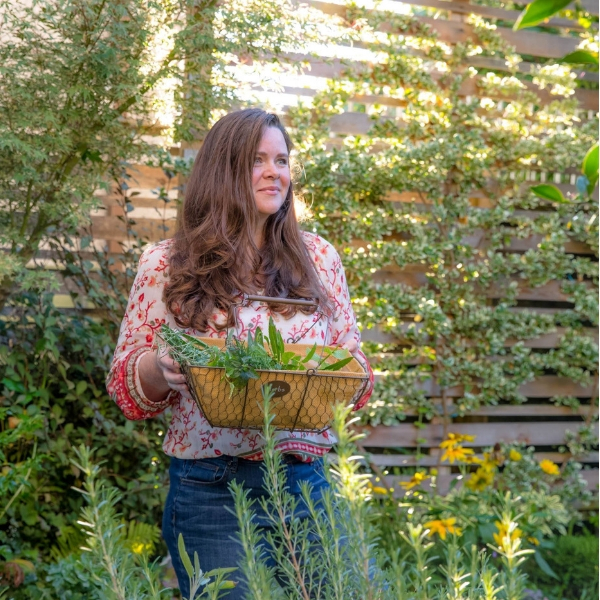 There’s nothing better than a backyard garden full of fragrant edible plants. Now that it’s harvest season, I’ve been researching ways to use them. I mainly use fresh herbs in cooking. Last year I made up a batch of yummy oregano pesto. I also made my own herbal vinegar, and of course I made this gorgeous culinary herb wreath. 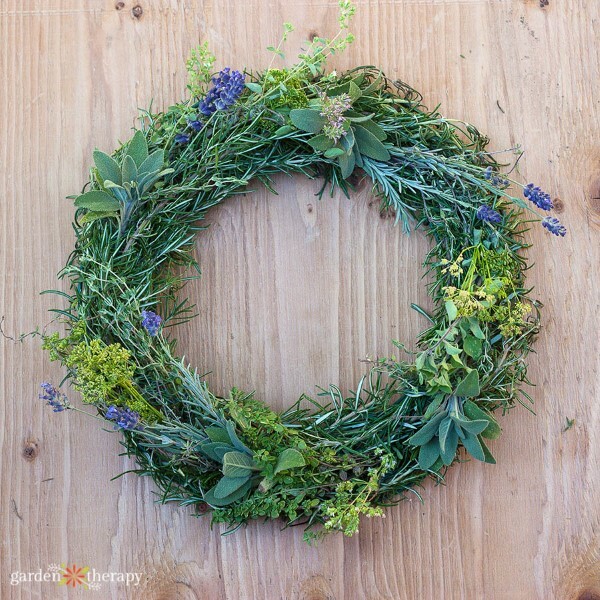 You can use a wide variety of herb stems, flowers, and leaves to make your wreath. I found it’s best to use woody-stemmed herbs (like rosemary, sage, and thyme) because they tend to hold their shape once dry. And don’t forget to add a touch of color by using herbal flowers such as lavender or fennel blossoms! Create a snip-as-you-cook wreath to hang in your kitchen. 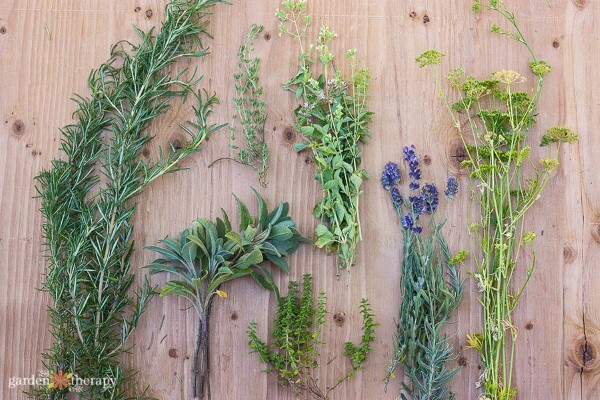 Good culinary herbs to include are rosemary, thyme, oregano, lavender, bay, and sage. 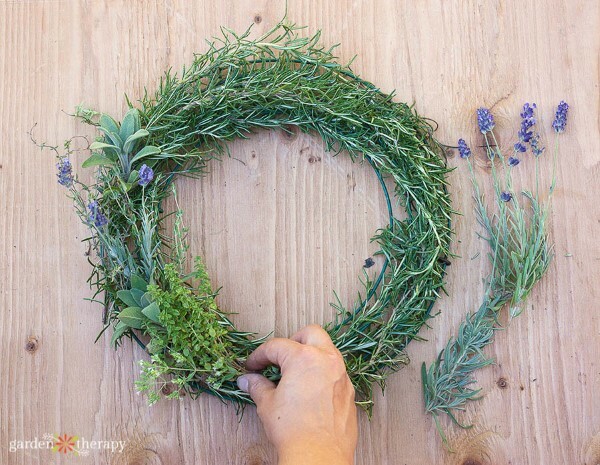 Gather your supplies and choose an herb to become the base of your wreath. I chose rosemary. 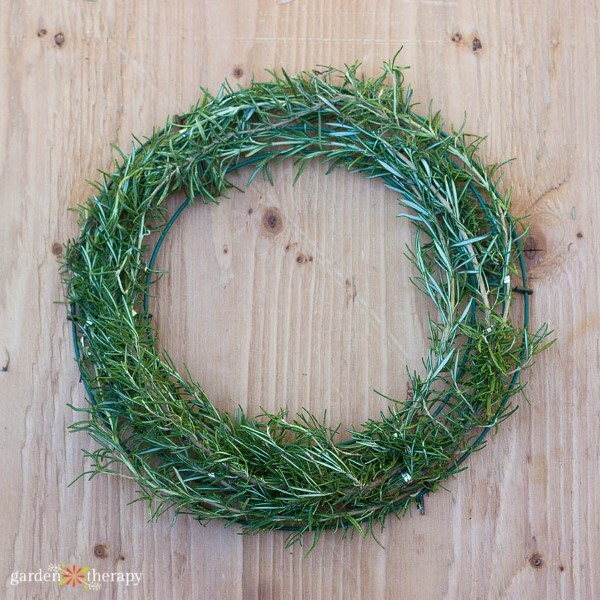 Using twist ties and/or floral wire, begin covering your wreath base. Be patient with this process. It took me longer to do this than I had originally anticipated. Once you have an herb base covering your frame, you can begin building off of it. There are a few different techniques I tried. 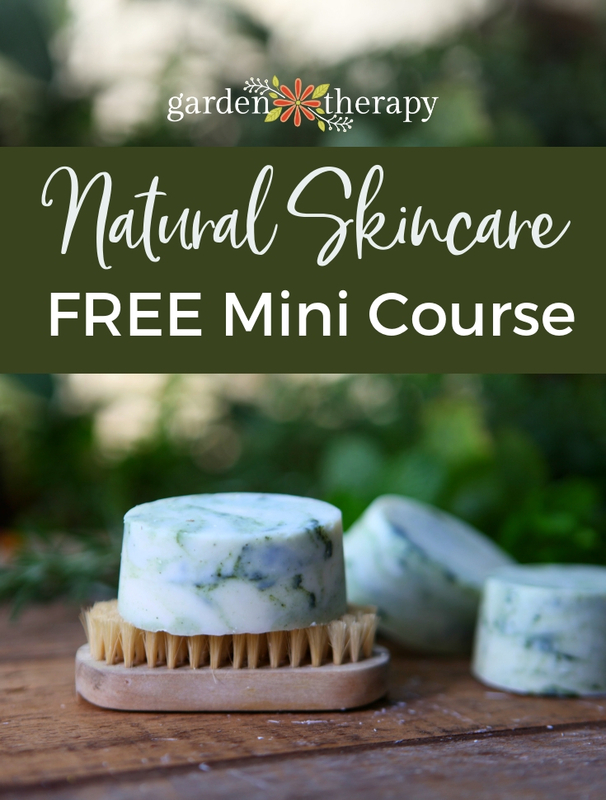 I selected 2-3 different herbs and created small bunches using rubber bands. Then I added each bunch to the wreath, using floral wire to secure it. The other method I tried was simply poking individual sprigs into the wreath and securing them again with floral wire. Work slowly and experiment with different placements and herb combinations. Continue to add herbs until you’ve completely covered the wreath frame. And that’s it! Now find a place to hang your wreath and enjoy. 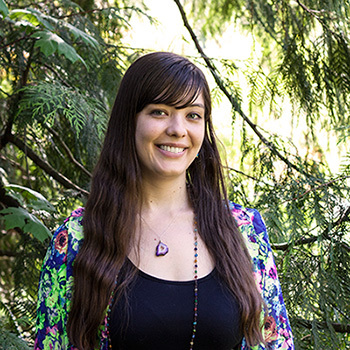 Rachel Beyer is an artist, designer, and creative maker living in Portland, Oregon. She spends her days working at Molly Muriel Apothecary and blogging at Adventures In Making. Her favorite hobbies include cooking, gardening, and crafting.